From the prolific hand of Bill Dixon, this great open launched in 2003 by Royal Denship. In effect, the Royal Denship 82 Open Motor Yacht we present here was at that time called 80' and as such in 2004 found favour with critics to the extent of winning the "Oscar" of the Superyacht Design Award in the category of "fast composite yachts" between 23 and 32 metres long. For further information contact Royal Denship A/S, Dalgas Avenue 42, 8000 Aarhus C, Denmark. Tel. : + 45 86 11 73 53; Fax: + 45 86 11 74 53; e-mail: info@royaldenship.com; website: www.royaldenship.dk. So there's just a two foot difference between the two boats, but these two feet make a certain difference not so much in form, since the exterior lines and volumes of the quickwork remain more or less identical, performances included. This because the extra sixty centimetres stern platform of this open, as well as better serving the function of trait d'union between sea and boat, are there to cover the supercavitating propulsion the boat employs. A system of surface propellers which, coupled to two MTU V16 2000 M91 for an overall 4.000 HP, greatly modifies the boat's performance, taking it from the already optimal 35 knots of the centreline version - which however has more "tranquil" 2x1.400 HP CAT - to no less than the 44 knots now attributed to the boat. As for cruising speed, it can keep up a 35-40 knot speed depending on weather and load conditions, with a range of about 600 miles. This new propulsion configuration is not however the only difference between the two boats, because while the 80' exists in only two or three cabin versions, this 82' has no less than four, probably to make it suitable for charter. Precisely for this reason, over and above RINA certification (Italian Naval Register), the boat can boast safety standards qualifying it for MCA certification which is necessary if it is to be chartered. The new layout, also by Dixon in collaboration with the Peters designers, includes a great owner's cabin amidships on the lower deck and therefore exploiting the whole beam of the hull. 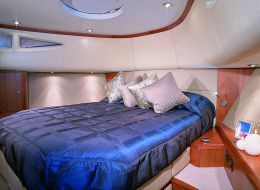 The cabin is served by a spacious bathroom aft with separate shower unit and a wardrobe. 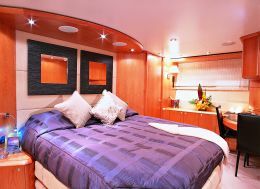 Going forward we come to two guest cabins with twin beds and a VIP cabin with double bed, all with en suite bathrooms. 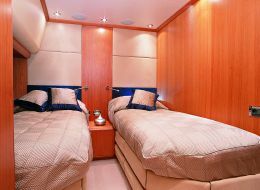 Still on the lower deck, between the engine room and the owner's area, the designers have placed the crew cabin, for skipper and sailors, also with bathroom and with an annexed galley and service dinette, in an area equipped with separate access to ensure guests' privacy. 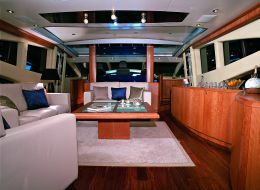 Going up to the main deck, forward, your attention will undoubtedly be captured by the bridge, set in a central and dominant area and with three comfortable armchairs. 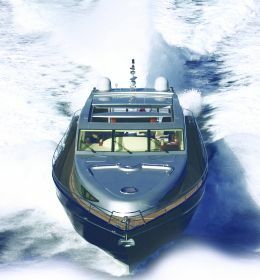 The décor and design are in line with the sporty and at the same time elegant lines of the vessel. The rest of the area protected by the hardtop - which has a large electrically opened sunroof admitting much air and light - is practically a single vast air conditioned environment, thanks to the big window that separates it from the cockpit. It is a semicircular living area with a low table on the port side and, opposite it to starboard, an internal dinette with sideboard and small armchairs. Externally the decks are all in teak, including the aft bridge and the double staircase connecting it to the cockpit. There is optimal access forward thanks to suitably sized gangways and the protection supplied by the bulwarks which become fairly high at the forecastle, almost concealing the deckhouse in a side view of the vessel. 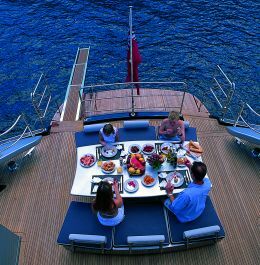 Right in the structure of the deckhouse, forward, is the large sundeck, while the cockpit features a dining table seating up to eight. 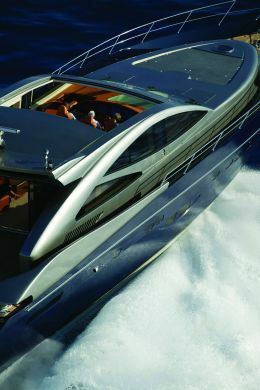 As for the tender, it is housed in a special space in the transom which opens up to facilitate launching and recovery. The birth of this Royal Denship 82' Open moreover seals the beginning of a new partnership between the Danish yard and the English dealer Peters, already known as one of the main international retailers of the Fairline brand. Substantially, the newly established Peters Superyacht, with headquarters in the south of England and in the Balearics, will be handling worldwide marketing of a new line of Royal Denship vessels, starting with this 82' Open. It will be followed by an 85' and a 96', both with flying bridge, while the flagship will be a 100' Open.